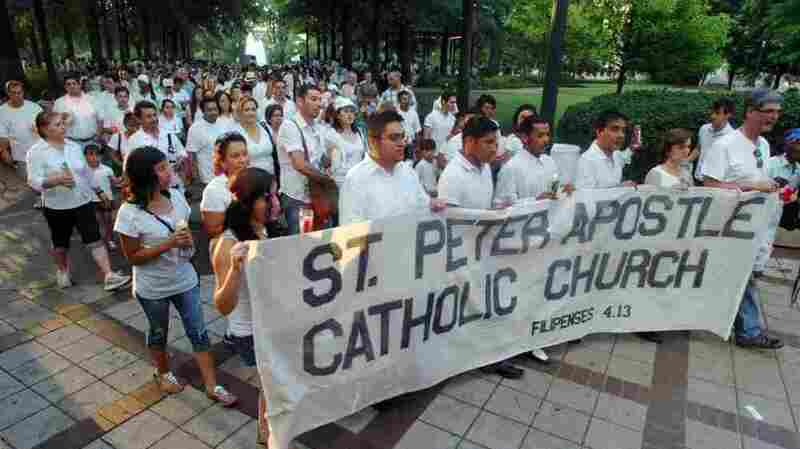 Clergy Sues To Stop Alabama's Immigration Law A growing number of critics say that the law that criminalizes all kinds of contact with undocumented residents — including harboring illegal immigrants — violates their religious freedom to be a good Samaritan. A U.S. district judge is considering Wednesday whether to stop the law from going into effect Sept. 1. 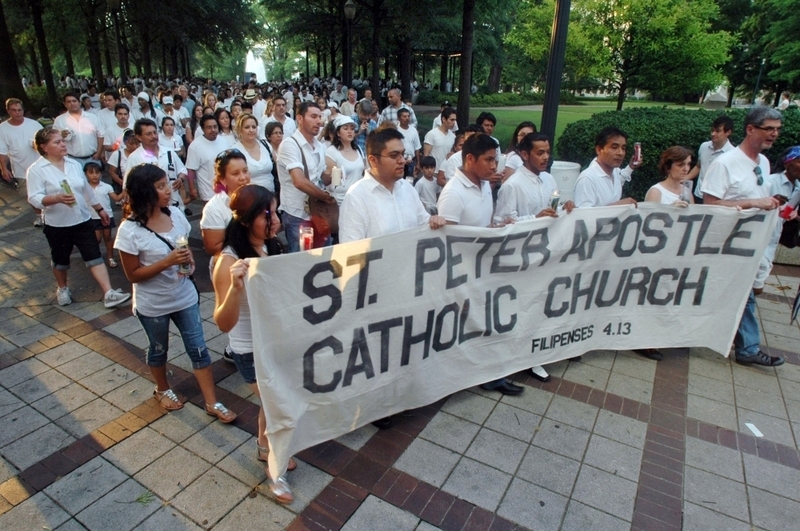 In June, marchers protested Alabama's new law cracking down on illegal immigration. The state's United Methodist, Episcopal and Roman Catholic churches have sued, arguing the law that's set to take effect Sept. 1 violates their religious freedom. Alabama's new immigration law gets its first test in federal court Wednesday. The Justice Department and civil rights groups are suing to stop what's considered to be the toughest illegal immigration crackdown coming out of the states. But the law is also being challenged from a Bible Belt institution. At First United Methodist Church in downtown Birmingham, clergy from around the city take turns leading a prayer service called in response to the new immigration law. Episcopal priest Herman Afanador, Baptist pastor Amanda Duckworth, and Methodist minister Melissa Self Patrick are part of a growing chorus of critics who say the Alabama law goes too far, criminalizing all kinds of contact with undocumented residents. It's illegal, for example, to knowingly enter into a contract with, to rent to, to harbor or to transport illegal immigrants. You cannot tell a church that if there's a man hungry out there, a family hungry out there, that they can't feed them just because they don't have a green card. That's not Christian. The state's United Methodist, Episcopal and Roman Catholic churches have sued, arguing it violates their religious freedom. Patrick, who runs the inner-city ministry of the United Methodist church in Birmingham, says being a good Samaritan could now be illegal. "This new legislation goes against the tenets of our Christian faith — to welcome the stranger, to offer hospitality to anyone," she says. Some here see the issue through the lens of Alabama's history, including Lawton Higgs, 71, a retired Methodist minister. "And I'm a recovering racist, transformed by the great fruits of the civil rights movement in this city," he says. Higgs says he and his church were on the wrong side of that moral battle in the '60s, so he is pleased to see the churches entering the fray now. He likens Alabama's immigration law to Jim Crow — legislating second-class status for illegal immigrants. "This is an expression of the same — what was called the white Southern redeemers," he says. But supporters say that's not a fair way to look at the immigration crackdown. "It's not about racism; it is just about citizen rights," says Shawn Shelton, who runs a Christian soccer league in Birmingham. Shelton says the current situation hurts out-of-work Alabamians, and immigrants who came here through legal avenues. He says the church lawsuit is off-base. You can't do things to help people remain in the state illegally. "It's not a separation-of-church-and-state issue here. This is an issue of right or wrong. And it is an issue of peoples' rights, even more so for the illegals," he says. "Who are they going to run to and say, 'Look we're only getting paid $6 an hour with no insurance and it's all under the table?' "
On Birmingham talk radio station WAPI this week, one of the bill's sponsors, state Sen. Scott Beason, disputed claims that the law will hinder Christian ministry. "You can't do things to help people remain in the state illegally," he says. "And that's a little different than going out and picking some kids up for vacation Bible school." A provision to exempt churches was removed for fear it would create a loophole for labor smugglers to claim they were on the way to revival. That's left a lot of ministers to navigate difficult terrain with their congregations. On Tuesday nights, member Brian Williams leads a prayer group at the Elkmont United Methodist church in North Alabama. The Rev. Robert Lancaster says the average-size congregation runs between 95 and 100 on Sunday morning. He calls it "very evangelical, traditional, conservative congregation by far." "We're a small country church but we're doing big things for Jesus," Williams says. As he and Lancaster chat, Williams admits that news of the immigration lawsuit brought by his denomination and others comes as a surprise. "I was not aware of that. I'm ashamed but I wasn't," he says. "I haven't exactly made that common knowledge. Because this is a very conservative congregation, and from the comments I've heard, I would say at least half this congregation — if not more — support the new law. So [it's] not a discussion that I really want to have at this point." Williams says he supports the new law, especially in a time of economic uncertainty and state budget woes. "There can't continue to be a huge influx and a tax on the system that comes out of my paycheck because we can't sustain it," he says. Still, Lancaster understands why the United Methodist Bishop sued. "You cannot tell a church that if there's a man hungry out there, a family hungry out there, that they can't feed them just because they don't have a green card," he says. "That's not Christian." The churches may get clarification on the law after a Wednesday hearing in Birmingham federal court. A U.S. district judge is considering whether to stop the law from going into effect Sept. 1, while all the legal challenges are sorted out.